Dynatrace provides full-stack monitoring insights into your complete IT operation and automatically detects if any part of your deployment doesn’t fulfill the required quality in terms of performance or error rates. Whenever Dynatrace detects such abnormal system behavior, it creates a single problem that contains all incidents that share the same root cause. Dynatrace sends out problem notifications to inform third-party systems about incidents within your environment. Following simple setup in Dynatrace, and definition of a custom message containing user-defined information, you can do this in Ansible Tower. Navigate to Settings > Integration > Problem notifications. 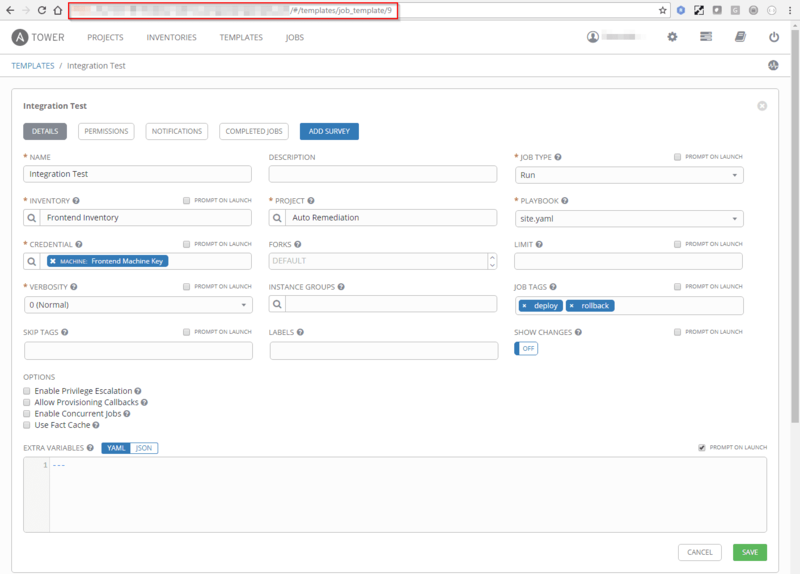 Click Set up notifications and select Ansible Tower from the list of available integrations. In your Ansible Tower instance, copy the URL of this template screen. 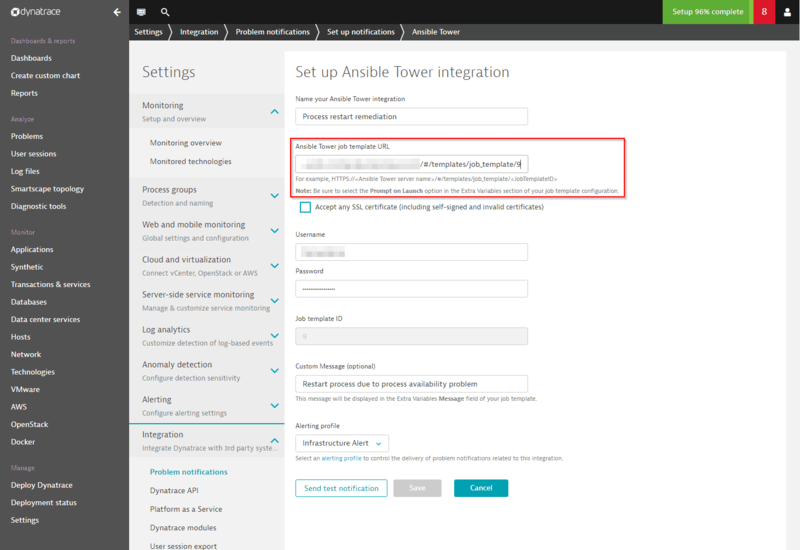 And paste it in your Dynatrace integration settings with Ansible Tower. (Optionally) Check the Accept any SSL certificate option. We strongly recommended that you use a valid SSL certificate (even for internal installations), but you can ignore the certificate for convenience. Enter the Username and Password of an Ansible Tower user who is authorized to trigger the job template via the Ansible Tower REST API and specify if your Ansible Tower installation must have a valid SSL certificate. (Optionally) Set up a custom message. You can use a custom message to transfer any user-defined information. All context detail related to detected problems is automatically transferred in the additional information payload field. Alerting profiles defined in your Ansible Tower integration configuration enable you to filter detected problems based on severity level or tags on affected components. For example, you can define an alerting profile that filters all problems except availability problems that occur on a specific tagged process or host. Once you’ve created a custom message and successfully sent a test notification to your Ansible Tower instance, save the integration. Of course, it’s possible to set up multiple Ansible Tower integrations to trigger different job templates for different kinds of problems. You can see results immediately within your Ansible Tower dashboard, which visualizes the successful runs of each template.